Recruitment is OPEN to Raiding applicants to fill 3 Ranged DPS slots (preferably not Mages, but Healers with a suitably raid-level performing off-spec would be welcome to apply under this), CLOSED to other Raiding applicants, and OPEN in general to Casual & Social applicants. Updated Friday 15th February, 2019. 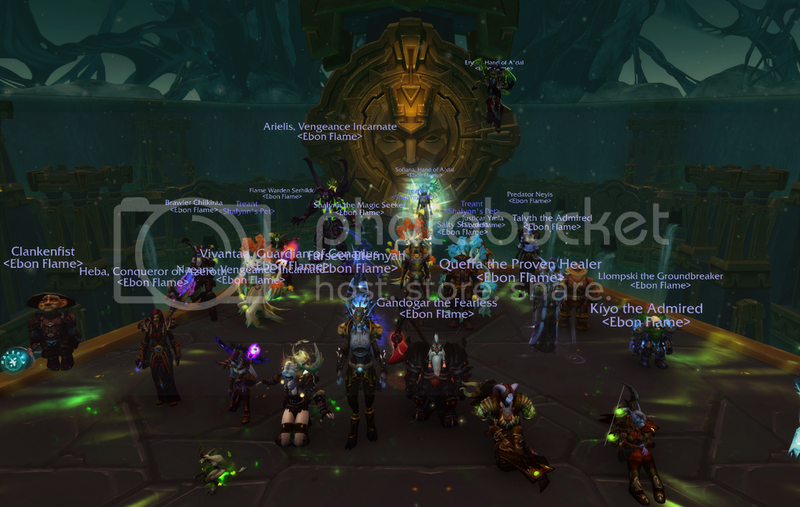 Battle of Dazar'alor: 9/9 Heroic, 1/9 Mythic. Motes of dust hung glittering in the air, seemingly suspended in the beams of light that trickled down through the cracks in the ceiling. Books rested on shelves or tables, open, closed, whole and partial. Even Deathwing couldn't have caused such a mess. The room looked like it had been put to the torch, extinguished, lit again and then been rampaged around by a horde of overly inquisitive piglets. Several humanoid robots, scale built replicas of Blood Elven arcane golems, were hard at work picking through the debris at their masters behest. In the middle of the room, Verannion stood looking out across the devastation. Occasionally a robot would scurry up to him with tomes in various states of repair, only to be sent away when it became apparent their find was not satisfactory. Sighing, the elderly gnome sat down, closed his eyes and pinched his nose. Youth, that was the thing. With no respect for the wisdoms of old, it was easy to leave these treasures scattered about without a care. He'd once pondered building robotic servants to maintain the halls, but had been gently and firmly discouraged by the Keeper. "No exploding contraptions are going to run around my castle", he had said. Typical night elf, and look where it had gotten him: Missing, no word on his whereabouts and now dust, DUST was covering every inch of this sacred place of knowledge. His eyes snapped open. Not every inch, no. He padded over to a nearby desk. Books where piled on high here, as if someone had gleaned through their contents and tossed them aside when they did not contain what was sought. Ridling through them, Verannion noticed a pattern; every book was emblazoned with the symbol of the Ebon Flame. Someone had been searching for guild lore. In vain. Welcome to the Ebon Flame! 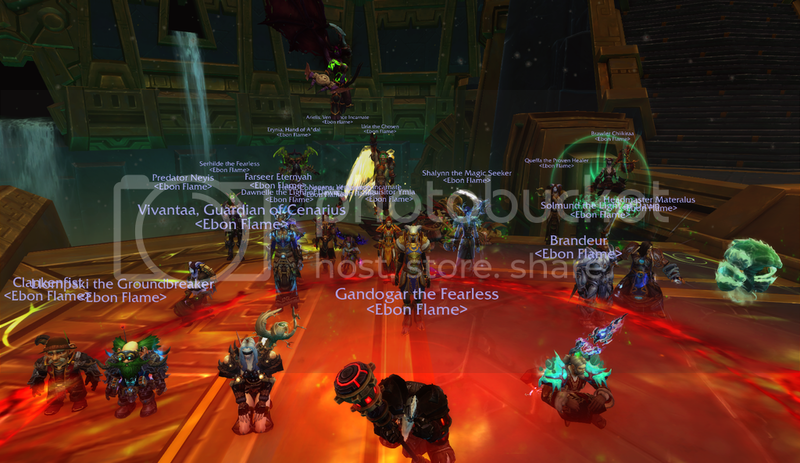 Ebon Flame is a raiding guild with a strong social and community aspect based on Moonglade, an RP-PvE realm in the EU. We are proud and honoured to be one of the oldest guilds in the realm, founded in December 2005. Today, Ebon Flame is a long-standing & successful guild with continuously active recruitment, significant resources in the form of a focused & well stocked/funded guild bank accessible to members & fueling the raids, and an active Officer corps. 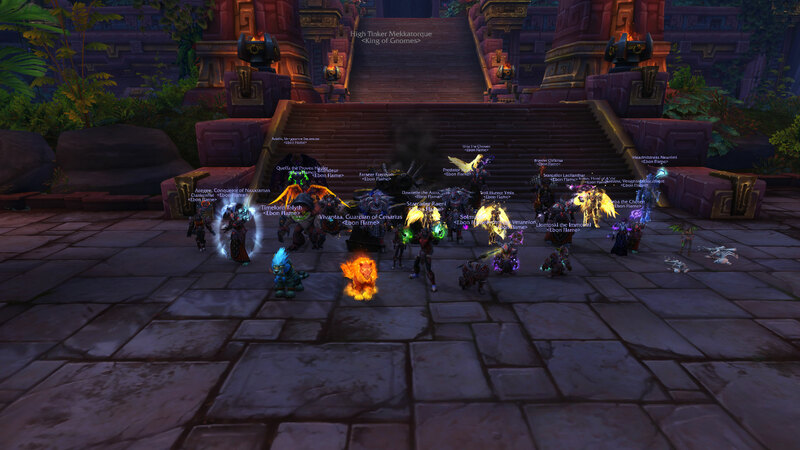 We field one raiding team, and we hit everything from Normals to Mythic - always aiming to better ourselves. We normally raid three times a week - 'progression' runs are made with a chosen team of dedicated raiders for whom performance is critical, and more practiced/casual runs are done with much more open inclusivity. We also ensure that no-one who has contributed gets left behind in the Meta Achievements. As well as our raiding successes, we pride ourselves on the stable and mature community we have built up over time - and welcome like-minded people to join us as social members. We encourage all other kinds of activities to take place, from PvP in arenas & battlegrounds to role-playing to PvE in instances and doing dailies together. We always aim to get to know each other better, challenge ourselves against the greatest of challenges available, and ultimately enjoy the game all of us have chosen to play by making a welcoming & friendly home for all of our members! 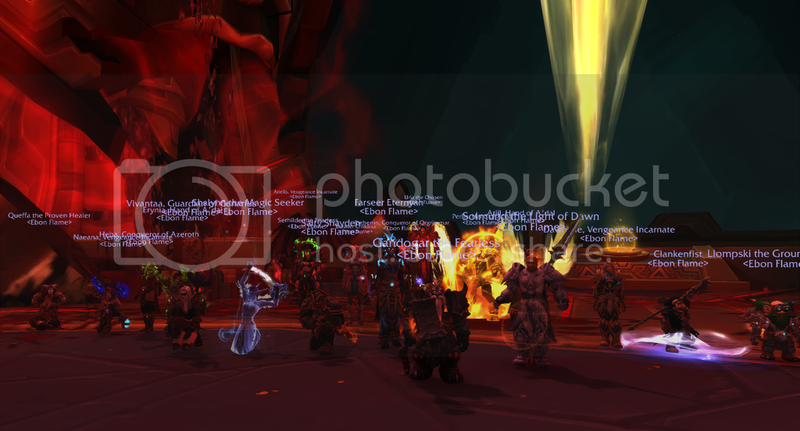 News has just reached the Ebon Flame of the defeat of Jaina Proudmore by a group of Horde champions. Representatives of the Flame rushed to her side to find out what had happened to her and help see to her recovery. Her bravery in staying behind allowed the rest of the Alliance force to escape Dazar'alor, including the warriors of the Ebon Flame. While the Ebon Flame was engaging with the Zandalari, a mysterious group of Horde champions defeated High Tinker Mekkatorque. A battle well fought! Tonight Ebon Flame completed it's first set of 'Glory of the Uldir Raider' achievements, obtaining Bloodgorged Crawg mounts for the those who got all the achievements. Well done to everyone and thanks to those who helped. 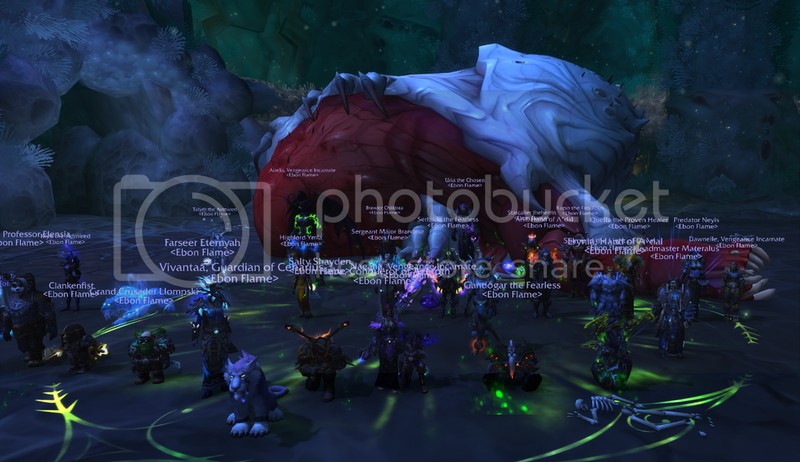 Tonight we got our first kill of Heroic G'huun to earn the 'Ahead of the Curve' achievement. It was a great effort by everyone who took part, we have saved the world from the corrupting disease of this monster. Tonight in Uldir we managed to show MOTHER that we are worthy to enter the facility and cleanse the corruption, again. In a close finish we managed to complete the encounter for the first time on Mythic difficulty, good job everyone! 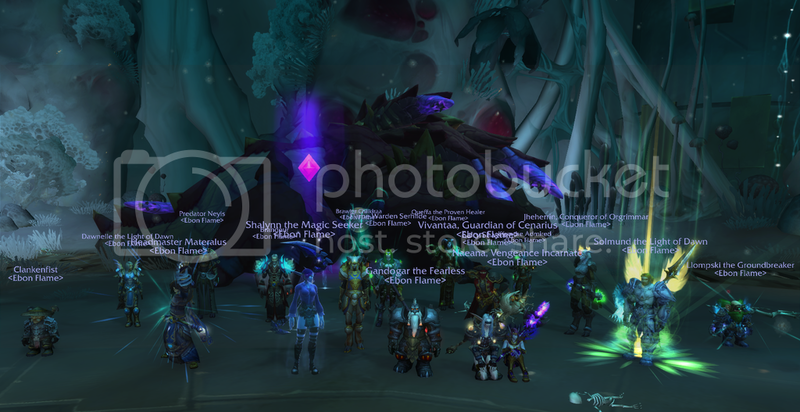 In the last week we managed to successfully push deeper into Heroic Uldir, with the Reborn Zul and Mythrax the Sythrax falling to the might of the Ebon Flame. 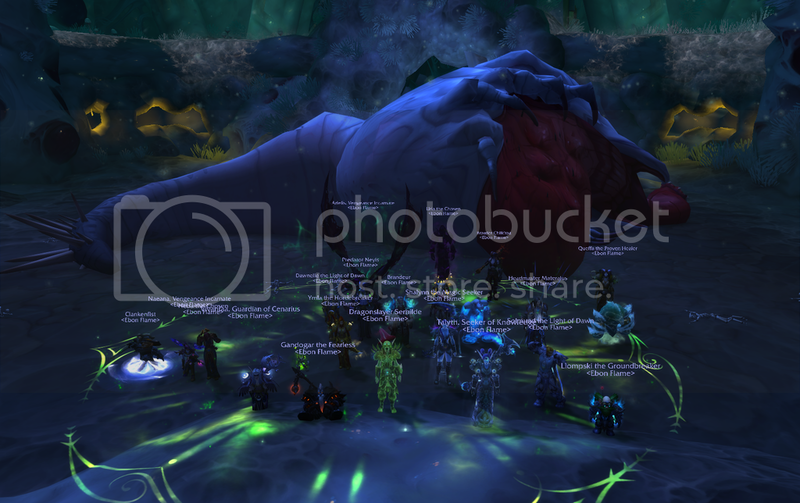 Just G'huun remains in Heroic Uldir. The first step into Mythic Uldir! 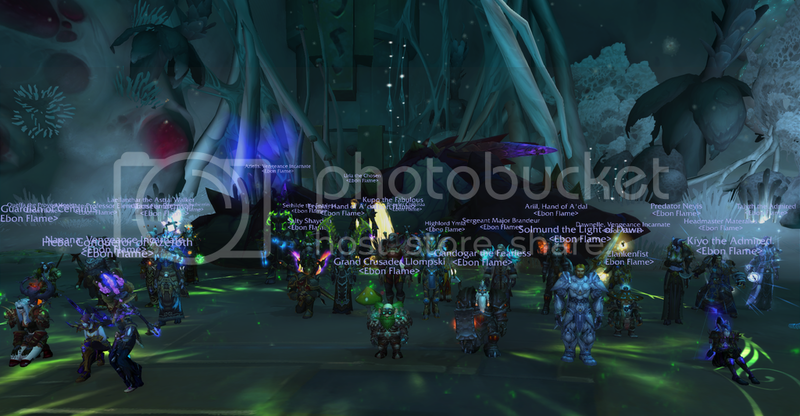 Our first night in Mythic Uldir was very successful and saw us quickly dispatch the corrupted defence mechanism Taloc, excellent work everyone. 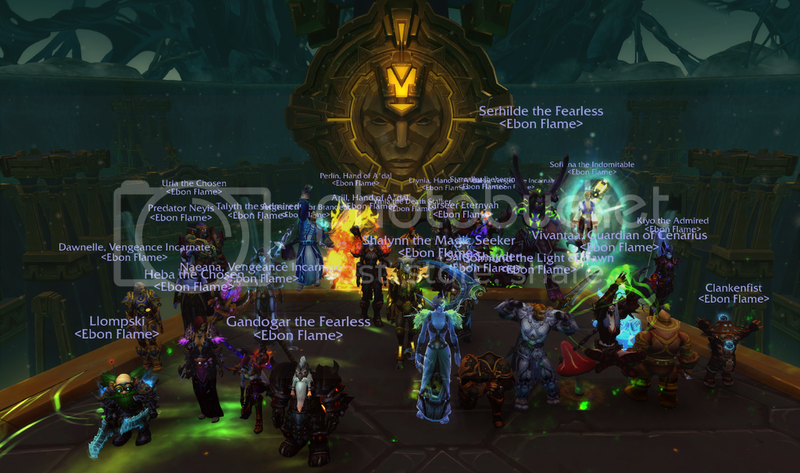 Ebon Flame began the third week of the push deeper into Heroic Uldir by eradicating the blood plague Vectis which had been released from it's isolation. 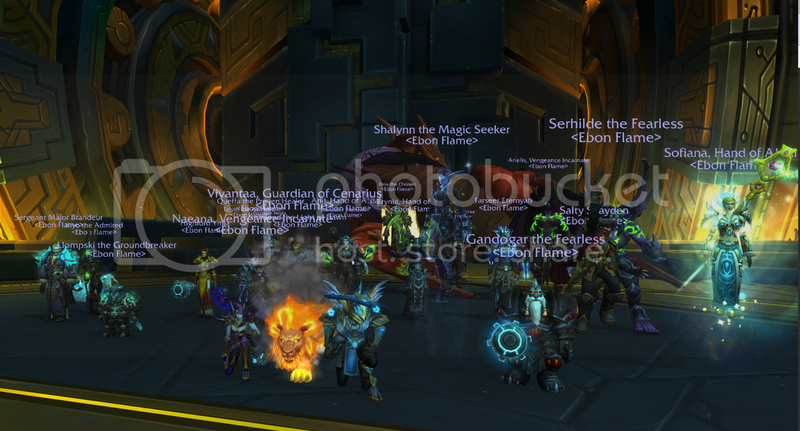 Tonight was the Ebon Flame's first foray into Heroic Uldir. The evening resulted in the defeat of Taloc and proving ourselves worthy to the Matron Of Tenacity, Herald of Endless Research (MOTHER) so that we can venture further into the Titan facility.